Oh, hey, Summer. I didn't notice you lurking around the corner, but then you popped out like a force... a force that won't allow the upstairs AC to keep up in our old, poorly insulated house. That's okay, though. You allow me to wear cute pineapple sundresses and help me keep my coffee/caffeine intake at a minimum. We can be friends, I guess. It has been a little warm around these parts, but we really don't mind. I'm in love with all seasons (even when they can be a little miserable) and summer is no exception! Swimming, watermelon (and pineapple, of course), late nights, fun trips-- just a few of my favorite summery things. How about you? Is there anything great going on in your neck of the woods lately? 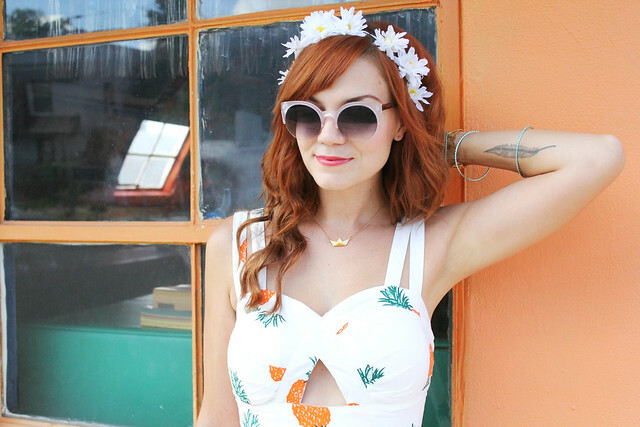 Your post makes me really feel like summer, also here in Germany the summer is at the moment not so reliable :) Wonderful dress! Such stunning photos! I love your shoes too! Love you crown! And I seriously LOVE and NEED those shoes! This dress is just so adorable! I love it! OMG What a saucy dress! A front cut out is so edgy and cool and you rock it so well! So artsy and cute :) I envy your ability to pick out pieces with little unique details! I think all the little cut-outs are a little too bold for me to wear, but you look incredible! And I love the addition of the ABM shoes - goes perfectly with the outfit. Ohhhh my gosh that dress is perfect. 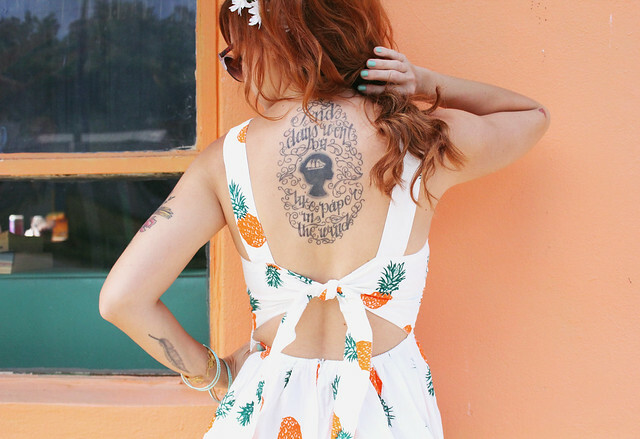 I'm so obsessed with the pineapples trend lately! I always want all your sunglasses! I love the dress! It's winter here in Australia and I am really looking forward to some warmer weather!! The style of the outfit is lovely, but the colors bring it to absolute perfection! I love that it is not bright but is still summery. And those shoes... I love them. It is HOT in Texas, but we have gotten a bit of a reprieve. Cloudy skies, sprinkles, and cooler temps. It is a lay on a blanket outside all day kind of day. gorgeous dress! it looks perfect on you! That dress seriously fits you soooo well! I adore this shoot! The little styling details and location you chose are lovely. Second shot is my absolute fave. I love your look, as always. Thanks for the giveaway. The dress is fabulous. Have a great day!